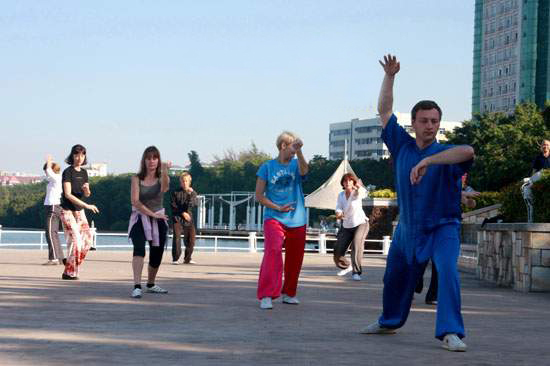 On Dec 29, 2010, nearly 30 Tai Chi enthusiasts from Finland, Ukraine, Russia and other countries gathered at the riverside of Sanya River to learn how to perform Tai Chi. During this winter, the World Shenzhi Tai Chi General Association will organize more than 300 Tai Chi enthusiasts from 23 countries to come to Sanya to practice Tai Chi. The members will include Chinese martial art masters as well as foreign martial arts champions. Among them, the oldest member is 70 years old, while the youngest is only 20. Every year, the favourable natural environment and warm climate of Sanya is attracting a large number of foreign Tai Chi enthusiasts coming to practice Tai Chi and spend their winter holidays in Sanya.